This is my supposed to be a half and half look. You can choose one or the other but you can do as I did if you so wish. Cover your lips in a Black or Deep purple Lip gloss, I used MAC from the Style Black Collection from 2009 in Blackfire. Track your Lines on your eyes using an angle brush and a blackish eye shadow. I used MAC Beauty Marked The lines do not have to be accurate as by the end of this look it is going to be ALOT thicker on the inner eye Do the same with your eyebrows, Line them first before you fill them in. Then it Is time for a rosie red eye shadow, I used Mac Passionate, cover your lid lightly Using any fluffy brush. Then using a blue, I used Mac Electric Eel, Above the line you have plotted mimic it and give it a higher point. Going back to your red, fill in the white inner eye point area, then plot a line above the blue. STEP SEVEN Use a purple eye shadow as your blush, I used MAC Purple Haze. Using the same colour, Go to work on your inner eye and underneath. PART TWO STEP ONE&TWO Whiten your face (especially covering your eyebrows) Taking a black eye shadow and angled brush plot your eyebrows, Make sure to REFERENCE THE PICTURES to get the right flow. STEP FOUR Apply any eyelashes to give the eyes a bit of oomph! STEP FIVE Fill your lips in red or black, both even, Try lining your lips in black and filling them in red, in the middle have some black lipstick blended in (or the opposite of that, it looks great, trust me)And that is it!!! It is THAT easy So much fun, Adore!!! I love this gorry idea genius amor. 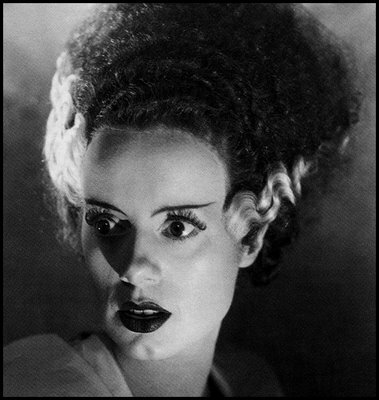 I was been thinking of dressing as Bride of Frankenstein ,but have so many other ideas. The half-and-half look is amazing!! I LOVED the blood effect on the bride-side. P.S. You make a way better Elvira than Elvira!